[S1138] Ancestry.com, 1910 United States Federal Census, Database online. Indianapolis Ward 2, Marion, Indiana, ED , roll T624_366, part , page . [S1141] Ancestry.com and The Church of Jesus Christ of Latter-day Saints, 1880 United States Federal Census, Database online. Madison, Jefferson, Indiana, ED 127, roll T9_288, page 198.2000, image 0012. John Morse married Brianna Leigh Carvin, daughter of Daniel Page Carvin and Michel Ann Beckerich, on 16 August 2008. (?) Geisel married Francis Barbara Beckerich, daughter of Peter Paul Beckerich and Magdalena Ernst, after 1900. Charles M. Galm was born in August 1881 in Indiana. He was the son of Martin Galm and Magdalena Beckerich. Edward G. Galm was born in May 1883. He was the son of Martin Galm and Magdalena Beckerich. Bertha M. Galm was born in November 1886 in Indiana. She was the daughter of Martin Galm and Magdalena Beckerich. Josephine A. Galm was born in February 1895 in Indiana. She was the daughter of Martin Galm and Magdalena Beckerich. Infant Joseph Beckerich was born on 24 December 1959. He died on 24 December 1959. He was the son of James Victor Beckerich and Kathleen Anne Sheller. Infant Joseph Beckerich was buried on 30 December 1959 at Holy Cross Cemetery, Indianapolis, Marion County, Indiana. Elizabeth (?) married John Joseph Beckerich, son of Charles Beckerich and Katherine Mary Beckerich. Mary (?) was born circa 1867 in Kentucky. She married William Peter Beckerich, son of Peter Paul Beckerich and Magdalena Ernst, circa 1898. As of circa 1898,her married name was Beckerich. Mary E. (?) was born circa 1869 in Ohio. She married Frank J. Beckerich, son of Peter Paul Beckerich and Magdalena Ernst, circa 1898. As of circa 1898,her married name was Beckerich. Jameson Pinkney Bagwell was born on 10 August 1889 in Louisiana. He was the son of George Washington Bagwell II and Joanna "Annie" Walker. Jameson Pinkney Bagwell married Eva D. (?) circa 1910. Jameson Pinkney Bagwell died on 5 August 1982 in Louisiana at age 92. He was buried at Springhill Cemetery, Springhill, Webster Parish, Louisiana. Horace Edward McGarity was born on 28 January 1885 in Calhoun County, Mississippi. He married Rosa Almedia Bagwell, daughter of George Washington Bagwell II and Joanna "Annie" Walker, after 1905. Horace Edward McGarity died on 11 August 1971 in Bastrop, Louisiana, at age 86. Eva D. (?) was also known as Ever O. (?) She was born on 3 August 1893 in Louisiana. She married Jameson Pinkney Bagwell, son of George Washington Bagwell II and Joanna "Annie" Walker, circa 1910. Eva D. (?) died on 15 September 1974 at age 81. She was buried at Springhill Cemetery, Springhill, Webster Parish, Louisiana. Wilson C. Bagwell was born on 31 March 1917 in Louisiana. He was the son of Jameson Pinkney Bagwell and Eva D. (?) He served as a private in the US Army during World War II. Wilson C. Bagwell died on 15 November 1995 in Alexandria, Louisiana, at age 78. He was buried at Springhill Cemetery, Springhill, Webster Parish, Louisiana. George Eldred Bagwell was born in 1925 in Louisiana. He was the son of Jameson Pinkney Bagwell and Eva D. (?) He served as S1 in the US Navy during World War II. George Eldred Bagwell married Jessie C. (?) on 12 January 1952. George Eldred Bagwell died in 1997. He was buried at Springhill Cemetery, Springhill, Webster Parish, Louisiana. Calvin C. Bagwell was born on 30 March 1928 in Louisiana. He was the son of Jameson Pinkney Bagwell and Eva D. (?) Calvin C. Bagwell married Juanita Y. (?) after 1945. Calvin C. Bagwell died on 22 April 2008 at age 80. He was buried at Springhill Cemetery, Springhill, Webster Parish, Louisiana. Jameson Pinkney Bagwell Jr. was born on 15 June 1929 in Louisiana. He was the son of Jameson Pinkney Bagwell and Eva D. (?) Jameson Pinkney Bagwell Jr. died on 3 August 1985 at age 56. He was buried at Springhill Cemetery, Springhill, Webster Parish, Louisiana. [S1147] United States Federal Census, Washington, District of Columbia, Population Schedule: La Junta, Otero, Colorado, Emuneration District: 164, Supervisor District: 3, Sheet: 1A, Dwelling: 9, Family Number: 14, Date: 1920. 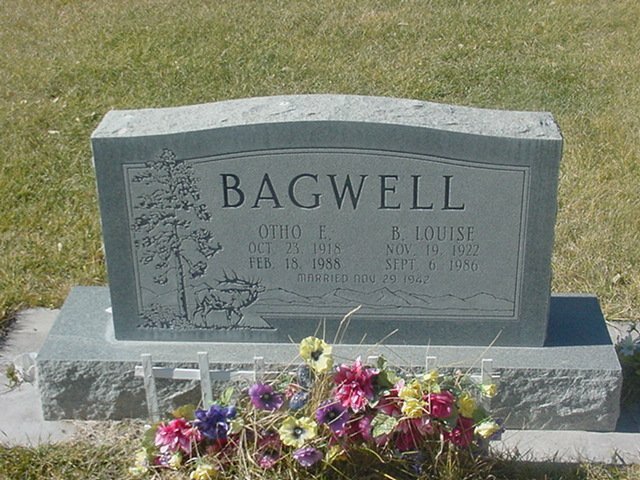 [S1153] Otho Edgar Bagwell Grave Stone, Find a Grave, www.findagrave.com. [S2350] Email from Tim Bagwell dated April 2014 to Hunter Wayne Bagwell; Subject Line: Tim Bagwell's Family. [S1154] Bessie Louise Dyer Bagwell Grave Stone, Find a Grave, www.findagrave.com. 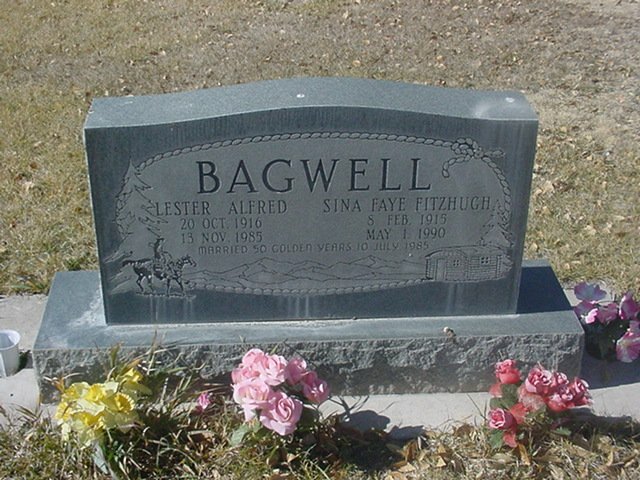 [S1155] Lester Alfred Bagwell Grave Stone, Find a Grave, www.findagrave.com. [S1156] Sina Faye Fitzhugh Bagwell Grave Stone, Find a Grave, www.findagrave.com.